Funny how going through all these posts and revisiting my older launchers makes me want to rebuild them so I can get instructions. I've been working on this for about a month now. Go check out my post on the Barackuda if you haven't already. What I have today is an updated version. The main difference is this one includes a striker guide. It's not as pretty as I'd like it to be, it's a little bigger than before, and the sights extend a ways from the top, but I think the addition is well worth it. It allows you to stack more bands on the striker with less flex. I'm still making a few adjustments here and there. The last time I made the Barackuda, as I mentioned, I got hung up on the little things and never did end up posting full instructions, only getting some pictures of the internals. This time I'm determined to get full instructions, though I want to tweak it a little more first. It performs admirably but is still limited. That said, I think it's still a great novelty to fire for being as compact of a bolt action as it is with an unconventional removable magazine. And here's a quick demonstration video. I'll get a more detailed video on how to load the magazine and use the launcher alongside the instructions. As for my plans for future builds, I think after the Barackuda, I'll finally get back on track toward making the next step in the guide series. Then there are other designs of mine I'd like to revisit and get instructions for. I've pretty much gone over all of my bigger contributions to the K'nex launcher community, so now I'm going to scrape the bottom of the barrel before I get back on track with other topics. I've had my fair share of experimental and incomplete builds. Most of these things were too inconsequential at the time to really be worth showing, but altogether I figured I'll go through each one quick. I have another collection I'll grab eventually of ones left on my 3DS (yes, I originally used my DSes to take pictures, hence why some of them are pretty awful). I've got a lot to show, but not much to say, so hopefully this doesn't run on too long for you. I apologize for how dark this photo is, it's really hard to make out what's going on. This was one of the very first repeating launchers I made before I really knew what I was doing. It had a small handle magazine and a trigger connecting a string to a rotating block sear behind the magazine. There was a phase where I kept reusing this semi auto slingshot mechanism for different launcher designs. One was in the style of a Bren gun. It was really clunky to reload. 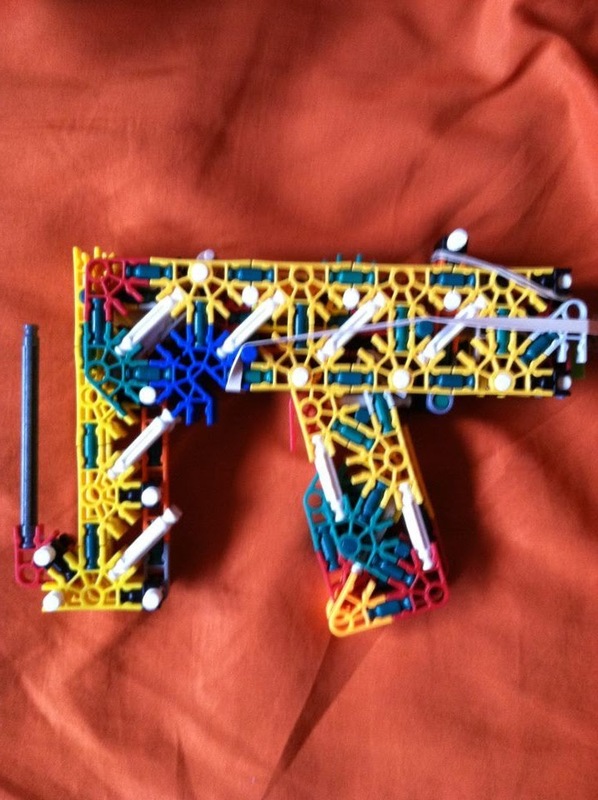 I've mentioned before I started as someone who wanted to make functional models of real firearms out of K'nex, though I never really did get good at it. Here was an attempt at an AR15 style one. This one probably won't mean much since it's the least complete thing here, but at the time I was thinking of making an XM8 using shelled ammo. I spent a lot of time coming up with the receiver area. The design was such that the actual projectile would be held in place, but once shot out, the force of the magazine would push the shell off a ramp and out the right side, which I thought was pretty slick. That said, I never made it a functional launcher. You get the drill by now, here was an iffy shot at the M1A1 Thompson. I didn't have enough pieces for the stock nor liked where the design was going. So this was silly. I remember someone else made an Stg-44 and basically slammed my original one, went on how theirs was the best and whatnot. I got all fussy since mine was really old and I figured I could've made a much better one by then. But, as you'd probably guess, I didn't have enough pieces. This one is a touch more interesting. It came right before the Oodassault 3.0 and gave me most of the design elements. The idea of this launcher in particular was a sort of mini slingshot. You'd push a black/clear rod through the front catching it directly on the band in back, then pull it the rest of the way to catch on the sear. The neat thing is this was quieter than a traditional striker-fired launcher. Its range and accuracy varied dramatically depending on when the rod began to spin out. Eh, actually that's enough for now. I have a few more to show in another post, plus whatever I can pull off my 3DS eventually. While I intend to design functional launchers most of the time, sometimes I just like to make things that look cool, typically designed to look like it could be based off a real firearm, but isn't. You'll notice I have a certain style I stick to while making such designs, evolving over time slightly. Here are a few. This was actually one of the very early launchers I made, and a lot of the design elements went into the AK-47 model I attempted. Technically, I think it was setup to launch projectiles, but it performed so pitifully and I couldn't be bothered to improve it. It was just designed for the sake of looking like a cool sniper rifle though based off of no real one in particular. Y'now, sad thing is I'm pretty sure I've had more examples in between here, but because they never functioned, I rarely bothered getting picture since they were mostly just for my own amusement and not to display. One example I do have pictures for was basically my UMP-45 body adapted to take a magazine for assault rifle ammunition to look like a compact subcarbine type firearm. I carried some design elements over into future mock models. Technically this is based on a concept firearm (the Magpul PDR), and technically it was intended to launch projectiles originally, but I think it's important to show this just to see where I got inspiration for future designs from. I really liked the design of the PDR, and I even bought an airsoft version of it eventually, but before I had the money to do that, I tried replicating it. Ultimately, I didn't succeed, but I came up with a functional removable magazine setup. 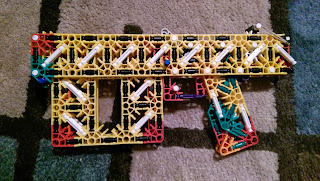 At some point, as you can see, I also figured out how to attach airsoft accessories to K'nex for making attachment rails and scope mounts. I'd end up turning the design into something more custom. I added a fake charging handle above the handle and I made what I intended to be a carrying handle scope, but it was mounted too low to give you room to hold it. I also added a small section of foregrip that would allow you to add a vertical grip. This isn't the first version actually, but ultimately the last evolution of what was based on the PDR design, cleaning up the last custom model I made. As you can see, it uses the same magazine setup. 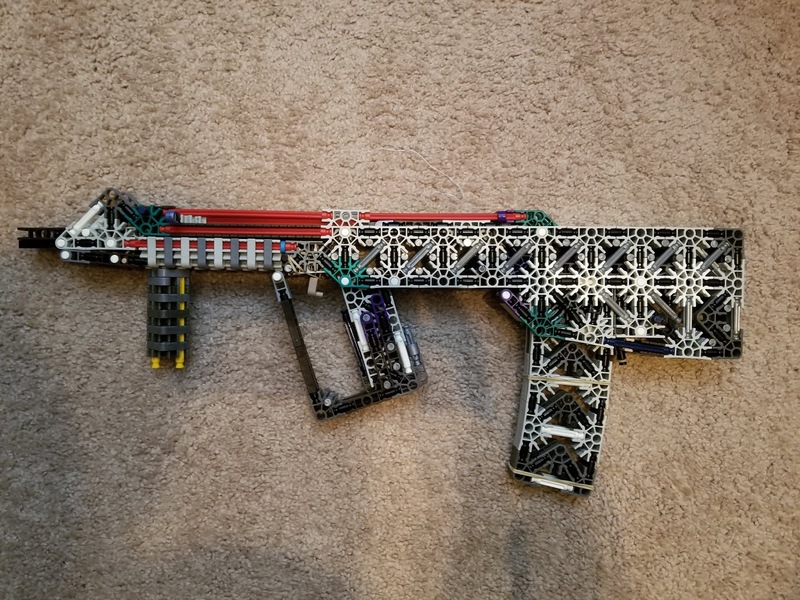 It had a charging handle above the handle but setup differently, a removable front sight, and a section of K'nex rail for sighting accessories. It used an elongated version of that grip from the UMP (which I actually got from someone else, though I don't remember who) that allowed you to attach vertical foregrips. This would be a reoccurring design element. This was a silly one which was basically just turning the above model into a traditional layout with a skeleton stock. The magazine rocked in AK style in this one. I didn't really like the design of this one. This one was called the SMRI, which never actually stood for anything it was just meant to be pronounced "Samurai". It was basically reattempting what I wanted with that previous model but doing it much cleaner. It had a straight in magazine but an AK-style charging handle/mock bolt carrier. The magazine didn't lock in, though, so I wasn't entirely pleased with this design. It had top and side rails for airsoft accessories and again a removable front sight for using sighting accessories. Funnily enough, I wanted to make the SMRI a functional launcher at some point, so tried to get some help in doing so, but ended up accepting it wouldn't work well and left it nonfunctional. This isn't quite the latest version, but there have only been some minor changes since this photo. I did come up with a really slick removable magazine setup in this one with a functional mag release lever. The stock design comes from a user The Red Book of Westmarch and is adjustable. The rear sight also folds down. Since it was originally redesigned to attempt launching projectiles, it has an ambidextrous charging handle striker that works with the trigger. I like this design so much I've still have it around, never having the heart to destroy it, still thinking of trying to make it functional someday. This was a launcher I was halfheartedly thinking of making function, but I just couldn't be bothered to finish it since it was designed more around the looks anyway. It took some design elements from the SMRI and the magazine connection method from the UMP. It was basically designed to look like an internally silenced SMG. I think I named it the Ninjato to keep in theme with the SMRI, thinking about making it a full series. There was otherwise nothing else special about it. Last one. I made this not all too long ago actually. It's kinda funny how I kept flipflopping. I originally made bullpups, then I made a traditional layout model of the bullpup, but then I improved the design with the SMRI, but then I wanted to basically make a bullpup version of the SMRI. However, as I designed it I decided instead to design something with the mentality of making it as compact and sleek as realistically possible, following design cues from real compact bullpups like the AUG, MDR, and MTAR. As such, I put the charging handle underneath the top rail and snug to the foregrip. I used the SMRI's better magazine system in the PDR's stock. It was a sleek design that I liked and considered trying to make functional somehow, but it'd be difficult without compromising the looks. I still had the SMRI around too, so I eventually destroyed this so I could work on other projects. These probably won't be the end of it either. Sometimes I just like to design something without worrying about it firing or not. Which one is your favorite? Have you designed any nonfunctional launchers just for looks? Let me know. In real firearms, shotguns fire shot, or spherical lead balls, typically multiple ones at a time. The clear benefit of having multiple projectiles fired at once is increased hit probability. 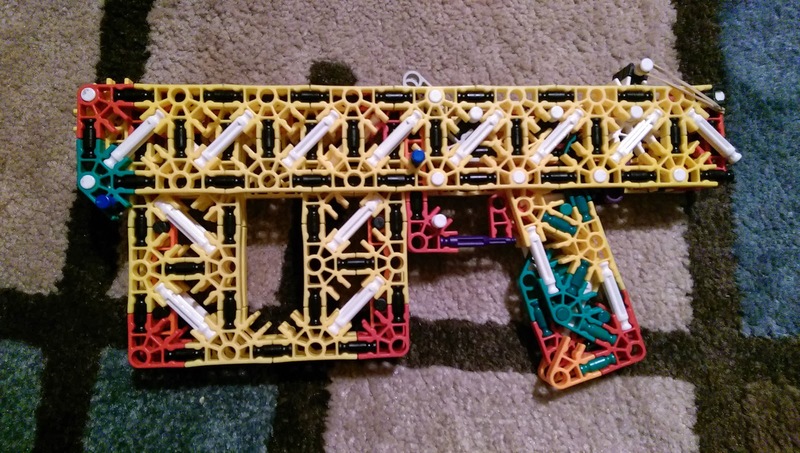 Likewise, K'nex launchers can be set up to launch multiple projectiles at once for the purpose of increasing the chance of hitting something (or someone in a war). 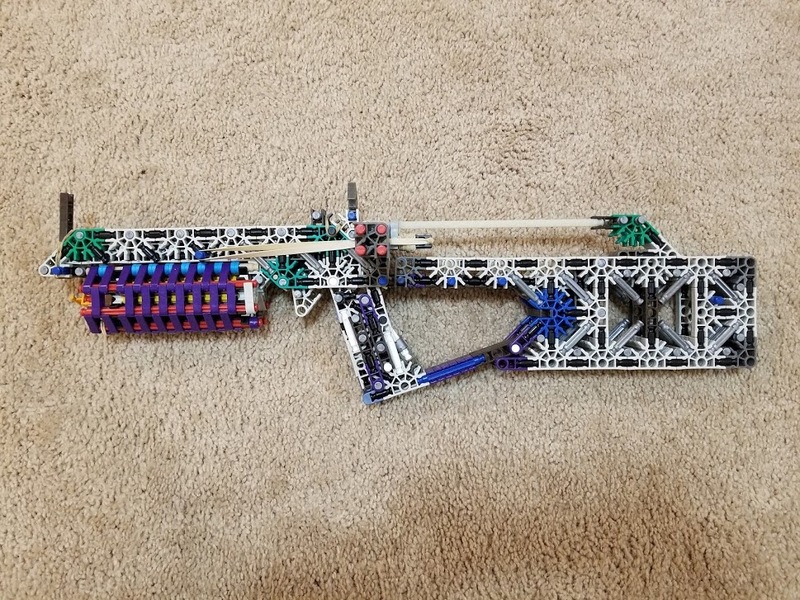 If I haven't already explained (and perhaps this deserves its own post), my personal view on effective war weapons is that emphasizing range is vain since K'nex simply aren't designed to fly far distances let alone accurately. I always figured a more effective strategy would be to increase output to maximize hit probability and overwhelm opposition up close when they were running low on ammo. So, I had an interest in making practical shot launchers. If you've seen my previous post on Assault Pistols, then the following is already familiar to you. At first, it was about making a semi-realistic shotgun shell as seen on the left. But making a design that fired them was difficult. So instead I made an easier to use flat shell that held 6 green rods. I made a relatively simple launcher to fire the shells. You loaded the shells in through a crude gate on the side of the front. It was novel, and the 6 green rods provided a lot of spread, but being limited to one shell at a time didn't make it all that practical for a war weapon. I wanted to figure out a repeating design, which is challenging because you need to both load multiple projectiles at once and then be able to fire them all cleanly. One method I was considering was basically making a magazine for the shells I mentioned earlier. However, this would be difficult and would not hold that many shells at all for the size of it. Eventually I came up with a simple concept where the striker had a connector in front of it, sticking out the sides, allowing it to hit 3 rounds at the same time all loaded from a 5 layer magazine. It actually had pretty good spread, definitely would've provided a benefit in a war. But it was more of a concept design, functional but not at all clean enough for me to want to post it. I requested that someone else clean up the design for me and make it into something postable. User TheFoofinator kindly did me the favor of improving and posting instructions for my concept naming it the Basic Shot Weapon (BSW). I was really pleased with his results, but I was skeptical with the concept after more thought, the striker being a weak point of the design. It also resulted in rather large launchers that took up more pieces than I had available. So then I tried out a concept to make a shot pistol. This one was based on my Oodassault 3 design, which resulted in a sleeker launcher. However, I designed it to attempt launching white rods, but the magazine just wasn't reliable at all. Rods don't like to stack perfectly vertically. I've since given up on making an effective shot launcher. A big problem with repeating shot launchers is their limited capacity and awful reload times, making them ill suited for primary use. I figured they'd only be practical as secondary launchers to use alongside a primary. They could either be sidearms like the above examples, or another concept I had but never came close to making was a combo launcher, a ranged-based launcher on top with a repeating shot launcher mounted below, preferably with a large magazine and a pump action to allow overwhelming firepower. The versatility would offer a huge advantage, and other K'nexers would explore similar concepts though often only with single shots of multiple projectiles, limiting their firepower. Perhaps shot launchers will never be a practical war launcher option. But they're still fun to mess around with. I hope someday I'll figure out a nice concept for a new shot launcher. So you may have read my post on the Oodassault series. At the bottom of the first part, I showed version 3.10 that I built recently. After letting it sit around for a while, I finally decided I'd get instructions and a video. 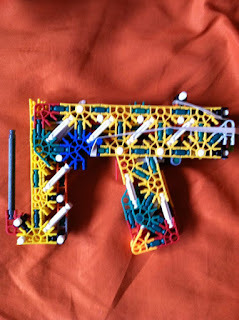 For those unfamiliar with the series and just interested in this one launcher, that's OK, here's a quick summary: It's a pistol-sized launcher that fires an ammo found by another user to have the best range and accuracy for purely unmodified K'nex ammo. As the name suggests, it's the 3rd version and 10th revision of a series I started long ago originally just to be the first of its kind, improving designs until it was finally a usable war launcher. It's built to be relatively compact and durable, and to get respectable ranges. The magazine tilts out and the mag follower locks down to make reloading quick and easy. I also designed clips to help make reloading quicker still. I've made other clip designs, but they weren't as durable. These can be safely carried in a pocket. I decided that while it's still around, I'm going to use Instructables since I like its editor, but if you guys would prefer for me to post instructions directly on here, let me know. Here's the link to the instructions. It might be a bit advanced for new builders. With the Oodassault deconstructed, I can begin work on my next project. I plan on revisiting the Barackuda, hopefully improving it, but at the least getting instructions for it too. I'm still planning on making a modular base launcher for the guide series, I apologize for the hold. As we went over in the last post, I had always wanted to design a bolt action but could never quite design one that satisfied me. Other builders had long since made their own personalized bolt action launchers and I didn't figure I could really do anything different from theirs. However, that changed. 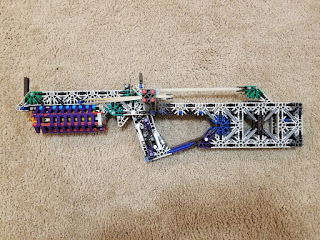 I had been out of college, with a job, living with a friend and coworker, but I still wanted to keep building with K'nex, so I'd have spurts of activity every now and then. One day I noticed how the teeth of gears fit in the grooves of rods. I kept experimenting until eventually I came up with a rotary magazine, which is a cylindrical magazine that uses sprockets to hold and feed the rounds. I later figured out I wasn't the first to come up with the idea for the magazine design, but it had never yet been used in a practical launcher yet. While it was meant to be a novelty, the nice features of this sort of magazine is that it holds a relatively large amount of ammo (10-12) compared to vertical magazines of the same height, and it's comfortable to use as a foregrip. I struggled, but I was determined to make a launcher for a bigger version of it. I figured, well, I always wanted my own bolt action, so I might as well design a bolt action since the magazine would probably get bad range as a direct load repeater anyway. And so I began designing the Barackuda (portmanteau of Barack [Obama] and barracuda). It worked nicely but I felt like the stock was awkwardly long and it didn't get as much range as I liked. Plus, reloading the magazines took a bit of time. As you probably know about me by now, I'm an iterative improver. Later on, I would get more pieces and rebuild the design to make more improvements. By now I had made a better stock, more reliable trigger that helped get better range, an easier to load drum magazine (gears since removed since they didn't help), a shorter muzzle to make muzzle loading single shots easier, more precise sights, and a safety system. I was really pleased with how far it had come, but likewise I couldn't get over my perfectionism. I finally got a handful of pictures to help others build it and then destroyed it to work on other projects. However, me being me, I've been thinking of revisiting it and then posting full instructions here. Forgive me that I can't provide more information for something I often take credit for having helped start. For those following the eventually-to-be-fleshed-out guide series, this topic might be a bit advanced for you but I'll try to give a simple run down of the concept. Then we'll be going over my Barackuda in the next post. So in real firearms, there are different "actions" for making the firearm ready to fire again. I won't get detailed, but one of the manual actions for repeaters is bolt action, where you operate a handle connected to the bolt to cycle the action. Typically this involves pushing a round out of the magazine up the feed ramp into the chamber. This term was borrowed for K'nex launchers where originally it just meant a basic striker action. Some people would add handles to their strikers to make them easier to charge, some that you would reset back into position like a bolt handle while leaving the striker charged (and this is still a common practice to make strikers easier to charge while not adding weight to them). However, one certain launcher caught my eye one day. I wish I could remember exactly what it was or by who. It was a bolt action that fed from a magazine above the barrel. There was a pin connected to the handle that pushed a round out of the magazine and into the chamber. This is where things get hazy but I believe it was done more for the novelty of it as the striker's full length wasn't used efficiently. So it gave me an idea. A problem with simple repeaters is that the rounds, especially rods, will cause a lot of friction and reduce the max range you can get. So I had the idea (though I probably wasn't the first, just as far as I can remember) to utilize a bolt action to dramatically increase the range of repeaters. I wanted to more efficiently utilize the striker length and to have a more traditional bottom-feed magazine. Truth be told, I felt too inexperienced at the time to come up with something alone, so I collaborated with Sol3kill3r to make something. Unfortunately I don't think he ever got pictures, only a video. I'll see if I can track it down somehow, but I believe he unlisted them. Anyway, it was a good start and I was excited to work on the design. However, I believe the story goes that he tipped off builder Zak on what we were working on. 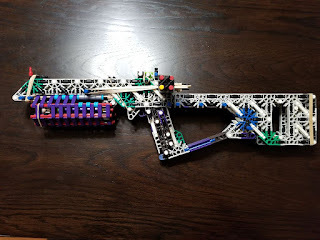 Zak then designed the ZKAR (Zak's K'nex Assault Rifle?) and beat us to the punch. The original post and pictures are since long gone, so I can't show his original design. I was peeved because he made a pretty excellent launcher that was the first bottom-loading bolt action with instructions posted, beating me despite it originally being my idea. His design exceeded what I was capable of at the time, but also had flaws. He refined the design over time and made the ZKAR V2. Luckily, someone else got instructions for it. It was a really rough design and just didn't satisfy me, so I never displayed it except as proof that I had designed bolt action myself. It was an attempt to use a removable magazine, but the method I used wasn't good at all. I scrapped this design pretty quickly. It was an attempt to design a bullpup (magazine behind the handle and trigger) bolt action, but I didn't have the pieces to finish, and the resulting stock would've probably been too long. I did test fire it and it didn't perform all that great since there was an excessive amount of barrel after the chamber. And so I went on sulking as a builder who never even made a good example of the idea I originally advocated for. Until just a few years ago, but we'll save that for the next overly long post. There was an interesting prototype weapon shown off at a firearm convention known as the FMG-9, or Folding Machine Gun. There was actually an even older firearm designed in a similar pattern, but we're not here to talk about firearms, except when they happen to inspire K'nex designs. The FMG-9 was a fascinating concept because it folded up into a box but could be deployed quickly into a stocked firearm. This posed an interesting challenge to replicate in K'nex. I'm honestly not sure who first might've attempted something, but the first that comes to mind was an attempt by builder Sol3kill3r. In typical fashion, I'm not having any luck finding pictures of his launcher. I wish I remembered more of the history here, because I'm guessing someone else might've made their own attempt, and then I was motivated to try something. My first attempt was awful. I aimed to make something compact but the result was something that looked ugly and barely worked. Still, the one innovation I added was a horizontal magazine for single-slot connectors + green rods. This saved me the effort of cramming a vertical magazine into the body somewhere. Recognizing that the folding functionality of it was just not worth it, I decided to expand on the horizontal magazine concept instead. The result was something that looked a bit more appealing in my opinion. Later on, someone else would try to make a more compact folding launcher, the most compact one yet, so me being me, I took it as a challenge to make something even smaller. My first iteration used a more traditional vertical magazine for single-slot connectors + green rods. Sorry for the awful picture quality. I believe someone suggested I try using Oodammo since I was so familiar with it. So I slightly redesigned the launcher. I've toyed around with ideas for other folding designs, but they're just so tricky. The more compact you want to make them, the less capable they generally are. But in my opinion it defeats the purpose if you make a large design. At the end of the day, folding designs are just a novelty anyway. Since Oodammo was the de facto best ammo to use, I used it for a lot of other experimental launchers. None of these were ever posted. First up we have a "compact" nameless Oodammo launcher. I believe I had developed this after the Oodammo 2 but before the 3. I came up with a trigger system that allowed me to easily separate the trigger and the sear along a yellow block body type launcher. I wanted to demonstrate this trigger so I made this. The gist of the trigger is that it allowed the magazine to be just in front of the trigger but allowed a full draw on the grey rod length striker. While I used this sort of trigger on other designs, I wasn't too fond of the design as an Oodammo launcher and didn't keep it around long. That said, I did reuse the body with minor modifications to fit it with a turret. Turrets and especially a launcher called the TR had been taking off for a bit. I wasn't too fond of turrets but I decided to try one out. In hindsight, for a turret launcher, this was actually pretty compact after all. But since it was designed as a pistol, it still more or less wasted the potential of the turret. I still didn't like the design and so I think I scrapped it fairly quickly. My next bit of randomness was something fairly simple. This was just a mini Oodammo pistol I made for the heck of it. I just liked the idea of having some really small and piece efficient launcher people could mass produce for small indoor battles or something. Then we have the Oodassault 4 candidate. At the time I thought the Oodassault 3 had limitations due to the design that could only be solved by having a larger body. I was taking development of this very seriously, asking for feedback from other builders on what they wanted in the "ultimate" Oodammo pistol. To its credit, it did have some features the 3 didn't, such as a striker lock, a realistically angled handle, and a fuller striker draw. The striker was a weird concept I had that didn't turn out. The ends of strikers need to be reinforced to handle the force of smacking against the back of the launcher, else the striker rod will disconnect and fly out the barrel. 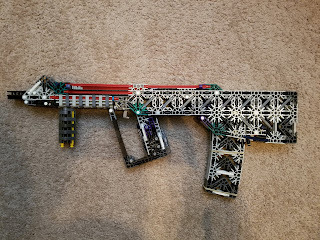 My concept was that if I attached extra connectors in such a way that they absorbed the shock instead of the connection between the rod and connector, I wouldn't need to add stuff on the striker rod itself to absorb the shock. Sadly, I was wrong, and the extra weight created quite a snapping sound and reverse recoil. As for the launcher, while it had potential, it wasn't quite reliable enough and I just didn't like the larger body. But it would influence a later design. This was Duncan's Easy, Random Pistol, or the DERP. I believe I built it my first year of college when I had free time in my dorm room. It's funny because it accomplished more than the would-be Oodassault 4 did, but by the time I built it, I had moved on and actually found this launcher somewhat "pointless" compared to other options out there. This one used removable magazines and was set up more reliably. It's also interesting to note that other than to make a place to put the rubber bands, this could've been created without any blue rods sticking out of the sides, something I liked about the Oodassault 3's design. So if I had to seriously consider a different design over the Oodassault 3, I would fix up the DERP and maybe post this later.